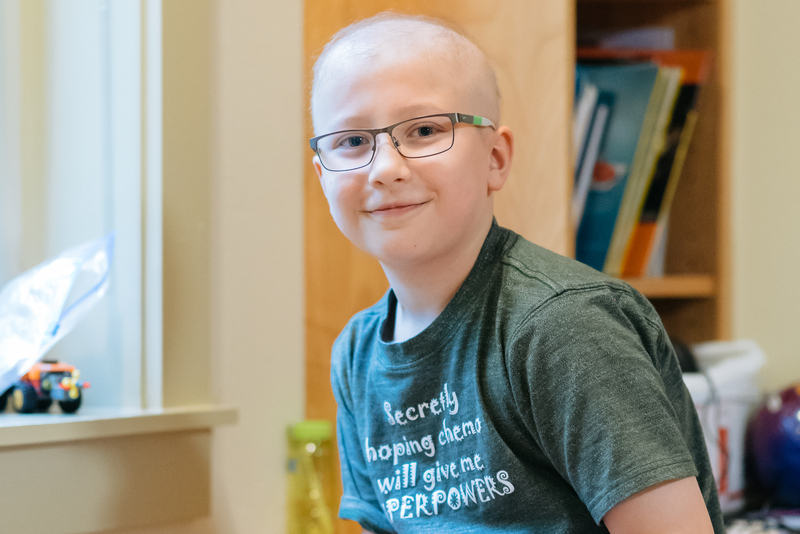 Earlier this year, ten-year-old Vail started to have headaches: terrible, debilitating episodes that often caused him to throw up or dry heave. His parents, Charlotte and Pete, took him to a hospital in Anchorage, about two hours away from their home, the small town of Kenai, Alaska. There, doctors discovered a mass between the ventricles of his brain. Vail was diagnosed with a slow-growing, noncancerous tumor and underwent an invasive procedure to relieve the pressure inside of his brain. Vail’s doctors expected the tumor to shrink with treatment, but a follow-up MRI showed that the tumor hadn’t gotten smaller. That’s when Vail was sent to Seattle Children’s Hospital, where he was diagnosed with a cancerous germinoma, a more aggressive form of cancer. When they first arrived in Seattle, Charlotte and Pete checked into a hotel, but they couldn’t afford to stay there long-term. And there was another complication: Pete needed to return to his job as a firefighter and paramedic in Kenai — but he had vowed not to leave Charlotte and Vail until they had a permanent place to stay. Time was running out. But a few days after Vail started treatment, a room opened up at the Ronald McDonald House in Seattle. The beginning of Vail’s treatment was tough: he felt sick and fatigued, but he wasn’t sleeping well. Charlotte started attending nearly all of the volunteer-led dinners and cooking breakfast and lunch for the two of them in the Seattle House kitchens almost every day. It was hard on the family to be separated. Vail’s younger sister, Selah, stayed behind in Anchorage, but Pete’s work as a firefighter meant that he was on-duty for several days at a time. To care for her, Vail’s older sister Katie — who attends college in Anchorage — drove back to Kenai almost every weekend. Eventually, it became too difficult on the family to be apart, and Selah came to the Seattle House to be with her mother and brother. As Vail’s treatment progressed, his energy level improved and he came to enjoy spending time at the Seattle House. He loves visiting with the therapy dogs, who make it a little easier to be away from his two dogs back home. And he has become good friends with some of the other residents. The holidays are a tough time to be away from home, but in November, Pete and Katie flew down from Alaska. The family spent the week together and had a Thanksgiving dinner cooked by volunteers at the Seattle House. And soon, Vail will finally be able to go home. He’ll have lived for more than six months at the Ronald McDonald House in Seattle, but he still has an upbeat view on his stay. Our donors and volunteers help us support families like Vail’s. To find out more about how to get involved, check out our Donate and Volunteer pages.